In the Academic Legion of Krakow, like in many other Polish communities, young Poles are being trained to handle weapons. Increasingly, women also want to prepare for the worst-case scenario. It's a strange feeling, as we turn onto a small forest path on this cold, damp November afternoon. Muffled explosions, ringing out every few minutes and slowly getting closer, accompany the sound of our steps. The Paris attacks were just a few days ago. It makes sense then, that such sounds give us goose bumps. Eventually a small group of people emerges in military camouflage. The full regalia – there are masks pulled over faces, soldier helmets and headsets, Polish emblems adorning uniforms and ammunition belts. If we didn’t have an appointment, I would really be starting to stress out. From a distance, they make a pretty freaky little group. As we get closer, some of them pull their scarves up over their noses. Others rely on masks, in order to remain anonymous. For a while we feel like intruders. 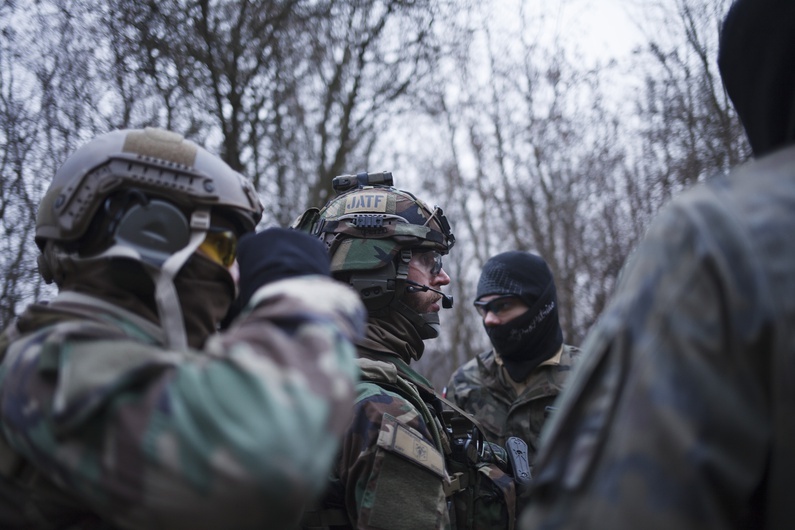 We're not even in a country at war, but rather in Poland, in the woodlands outside of Krakow. "You could have given us a quick call," says Piotr Wilczyński (32), the group’s trainer, brusquely instructing us not to take photographs of certain participants. Today there are members of the Polish Secret Service here. That’s what he says at least. Roughly 25 young people, including six women, have come today for outdoor training with the Legia Akademicka (Academic Legion), which has been going on since the early hours of the morning. The newcomers want to learn how to use weapons under extreme circumstances, to defend themselves and their country. 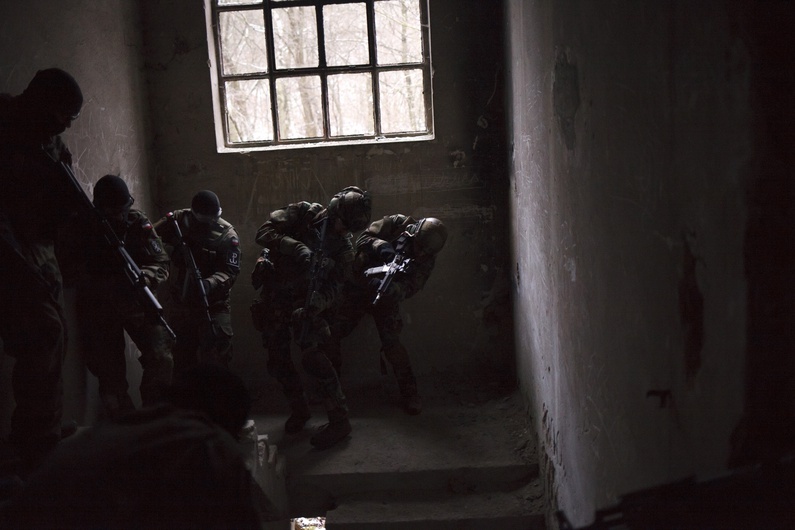 Today, they have handled several different firearms, detonated grenades and "rehearsed war" against one another in small groups, in an abandoned building covered in graffiti. And they’ve paid for the privilege – the theory course costs 5 zloty, but add in weapons and shooting training and "legionnaires" are set back 75, while non-club members pay 90. In recent years, more and more women have become interested in engaging in such group civil defence exercises. Dominika is one of them. 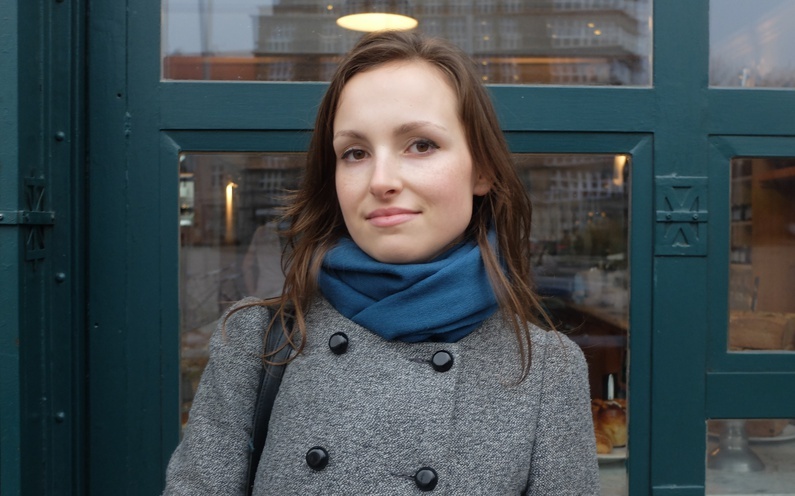 She is just 19 and is a first-year student of "national defence" at the Jagielloński University in Krakow. She heard about the Legia training from friends. The young Polish woman wears a salmon-coloured coat and a thick black woollen scarf over her uniform. "It is important for woman to be able to ensure our own safety," she says. "Who knows if we might end up at war again at some point." According to a 2015 study by the television channel TVN24, Dominika is far from alone in thinking this way. 39% of Poles fear that there could soon be a new war in the country. 49% believe that the international community would not stand up for Poland if this were to happen. Since Ukraine's conflict with Russia, a growing number of Polish citizens have mobilised to defend their country in homeland security associations. Between 30,000 and 40,000 Polish men and women are now ready to take up arms if war were to break out. The group has also been working with the Polish Department of Defence since last year. The Krakow Legia – which gathers its recruits solely from the academic world – can now count on 600 members, explains Piotr, who in 2012 revived the volunteer corps originally formed by students in 1918. 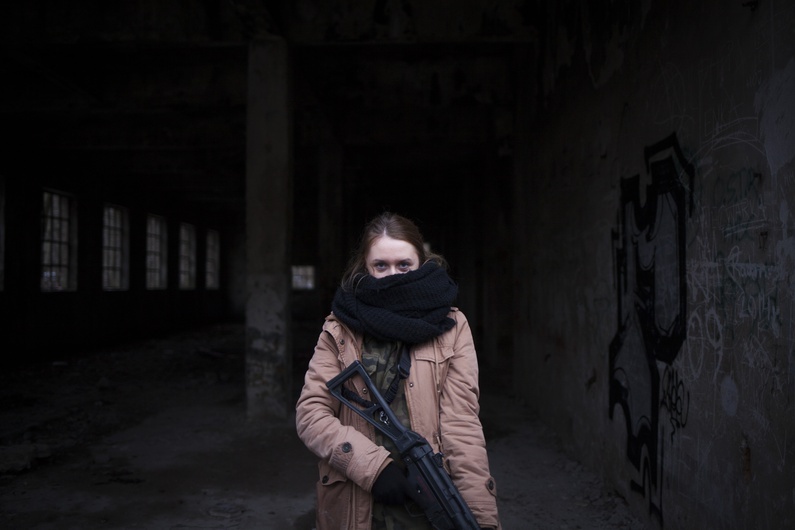 When we ask Dominika to pose for a photo, the trainer advises her to hold her gun straight. "For me, using a weapon is nothing special," says another fellow student, "You feel sort of powerful." A little later, one of my fellow combatants nods in the direction of the building, crying "Go, go, go, go, go! "As a group of six, we crouch in a row at the entrance, with the aim of eliminating the enemy team hidden somewhere inside. Breathing is difficult through the camouflaged protective mask. It is the first time in my life that I am holding a weapon and I have to admit it's pretty heavy. Seriously, what's making young Polish women do such a thing on a Saturday afternoon? Earlier in the day, a good hour’s drive from airsoft guns and face masks, I'd waited for Patrycja in the centre of Krakow. She has already taken part in LA training and was one of the few women on Facebook to agree to a meeting. Although participation in these sessions is not entirely kept under wraps – almost all members are publicly tagged in photos – the Legia is run fairly secretively, functioning a bit like the elite social media site A Small World. You have to know someone who knows someone. By invitation only. "Honestly, I never thought about real people when shooting," says Patrycja, a 25-year-old environmental engineering student, running her perfect mauve, manicured fingernails through her long brown hair, "For me it was more like a sport, a new challenge. But when you look at what is going on in Paris and elsewhere then I think that there are dangers out there for me and my family and friends. In that case it's good to be able to use a weapon." The threat of an impending Russian invasion has recently been compounded by the threat of Islamist terrorism. "You know," she explains, "if just one person had had a weapon at Bataclan, some lives could have been saved there." Piotr also confirms the view that multiple threats exist today: "Above all, people want to defend their home. But against whom, they don’t know exactly. It could be little green men from Russia, but also immigrants turned hostile, or other criminals. Nobody trusts our small army or police force." Is this a kind of Polish paranoia? Piotr knows all about his nation’s wounds, about the country always being at the mercy of major foreign powers. Poland does not want to give up its 25 years of independence. But don't we live in 2016? Isn't Poland the sixth largest economy in the EU? "All Western propaganda," he says, arguing that Poland has long since degenerated into a colony of foreign companies. The Legia is however not politically engaged, he asserts when asked if the accusation that the homeland security services have a nationalistic focus is justified. Anyone with Polish citizenship is allowed to take part. 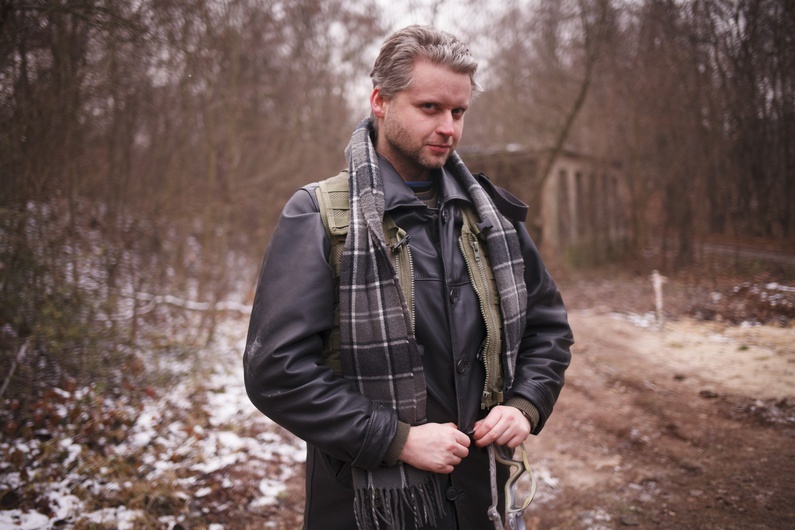 When Piotr is not standing to attention in the woods, he is a regular Geography lecturer at the University of Krakow. It's currently during his office hours and students are bustling about outside his office, number 425. It almost feels like being in a spy thriller as Piotr talks of the glorious actions of the Legia, Russian espionage and his "romantic patriotism". "You’ll see for yourself, it’s real," he laughs, while his colleague calmly sits next to us, eating a yoghurt. Back in the woods, and we've advanced into the dilapidated building, getting as far as the basement. I was hit by the opposing team and taken out (getting hit with an airsoft rifle hurts like hell). The mood is now more playful, people have thawed out a little, masks are being removed, sausages grilled and weapons put back in their trunks. It almost feels like being in the Scouts. Were it not for one "legionnaire" with a bleeding gunshot wound to the face. It’s no wonder that most girls, according to Piotr, only come to training once. 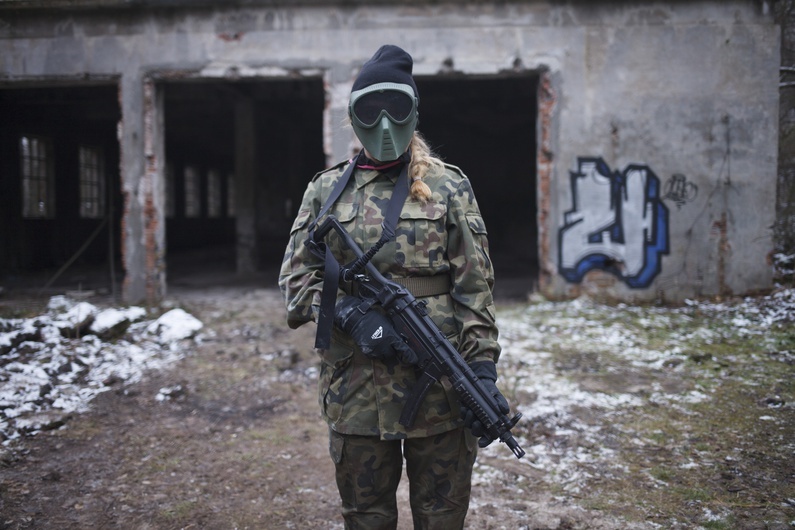 "Each new experience makes you a better and more interesting person," Patrycja says, remembering her first session of weapon training, "Whether it be language skills, belly dancing, learning to use weapons or reading a book. Shooting is good for you, but I don’t really see myself fighting in a war. I’m a simple girl you know: I study, I do leisure activities and someday I want to start a family. These days a lot of people are talking about a Third World War. A little part of me thinks there could be some truth in that. And as a woman, that makes me a little bit scared." This feature report is a part of our EUtoo 'on the ground' project in Krakow, seeking to give a voice to disenchanted youth. It is funded by the European Commission.